Is An Aspirin A Day Still Considered Safe? Taking an aspirin a day may lower your risk of heart attack, but daily aspirin isn't for everyone. In addition, taking more than one a day may lead to serious side affects. According to the Mayo Clinic, the aspirin a day recommendation should only be for people who have had a heart attack or stroke, or are at risk for one. This should only be done under a doctor's care. For most people, it would be considered safe to take an occasional aspirin or two for pain. 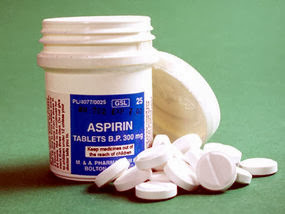 But even with heart risk patients, daily aspirin can cause serious side affects. Potential side affects from daily aspirin include bleeding of the stomach, stomach ulcers, or developing an allergy to aspirin. In addition, it is dangerous to stop taking aspirin cold turkey. Why? Suddenly stopping daily aspirin therapy could have a reverse effect that may trigger a blood clot. If you have had a previous heart attack, a sudden stop in daily aspirin could trigger a serious heart attack that could endanger your life. How much aspirin is safe? All medication taken on a regular basis, even aspirin, should be taken only at the advice of your doctor. A safe dose is 75 milligrams, which is less than what is in a baby aspirin. But even this amount should not be taken independent of your doctor if you have diabetes and are over 50, have had a heart attack, or are considered high risk for one. The bottom line on aspirin and any over-the-counter medication is to take them exactly as recommended and only under a doctor's care if you have other health issues.